Every month, Team Yarnbox works to curate an exciting combination of incredible yarn and patterns that will bring you joy and inspire your next project. 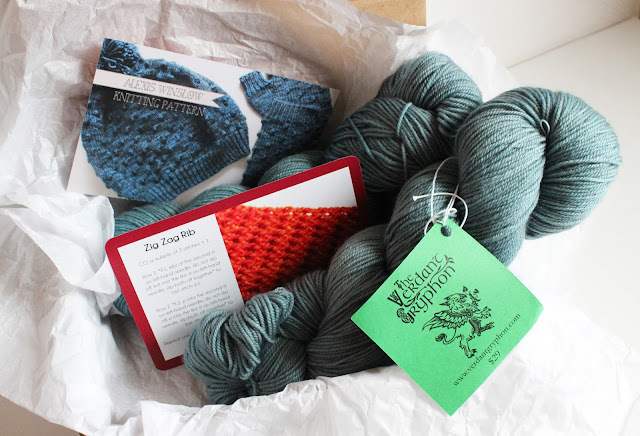 In addition to all this yarny goodness is the incredible community of Yarnbox subscribers on Ravelry. Our Ravelry group page is the go to place for many of our subscribers looking to see what others are making with their monthly boxes. 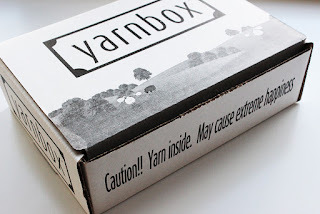 Each box has a designated discussion thread where members celebrate receiving their latest Yarnbox and begin plotting their next fiber adventure. If you can't wait till your box arrives and you just need to know what's inside, you'll find spoilers in these threads. If you prefer to have Christmas every month, you may want to avoid the threads that say **Spoilers**. 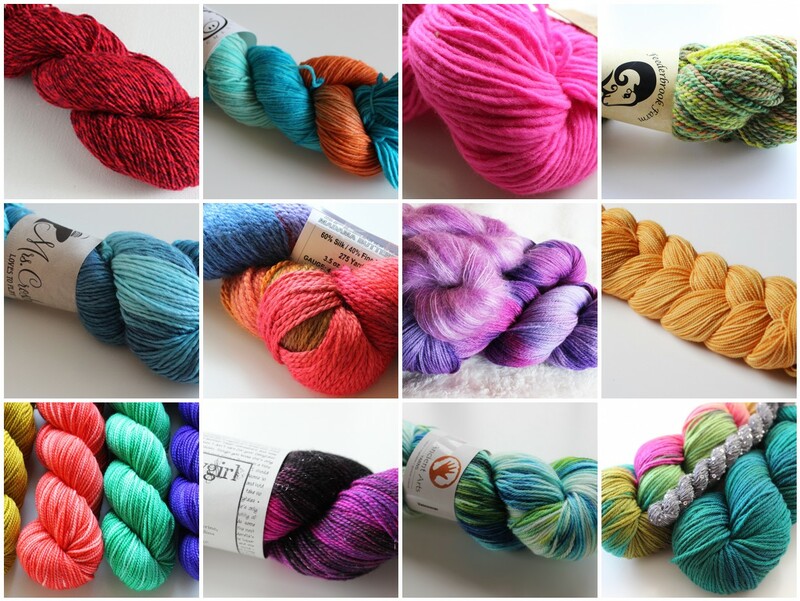 A special ISO (in search of) and Destash thread is set up for those looking to sell, trade, or find some yarn from a Yarnbox shipment that's no longer available in backstock. This is also a great place where new members who have just joined can look for yarn from previous boxes that they may have missed. Occasionally, we have special Ravelry events for our members. 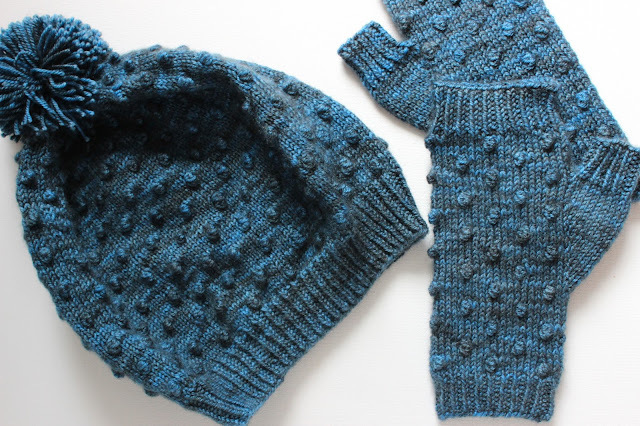 Currently, our Yarnbox Summer Sweater KAL/CAL is winding down while our #WatchMeWip competition is heating up. Both groups have sparked great discussions that help in motivating everyone through their projects and offer assistance to those who get stuck along the way. Our group is managed by an amazing group of moderators that are also subscribers and help answer questions and make your experience just that more fun. Because, when it involves yarn, isn't that what it's all about?! Join our Ravelry group at www.ravelry.com/groups/yarnbox and stay updated on all the happenings, events, contests, and content of each Yarnbox shipment. And better yet, see all the lovely finished knit and crochet pieces handcrafted by our talented members. August Classic Review: The Verdant Gryphon Bugga! Sometimes, when yarn already has a cult following, we're a little reluctant to put it in a Yarnbox. 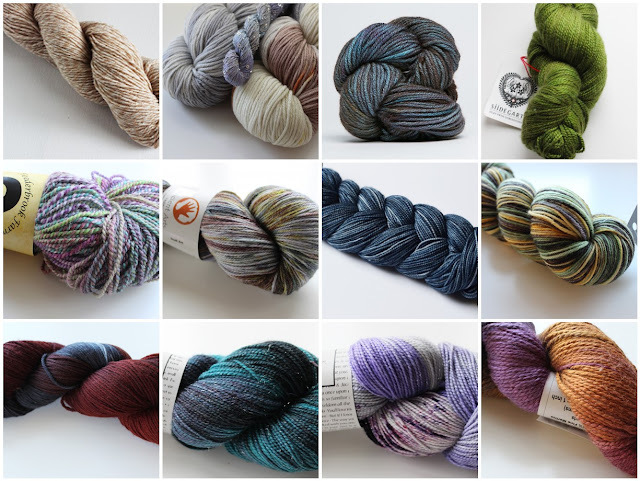 Not because we don't love these yarns, but because we know that our members join to experience something new to them -- we try to honor that with our selections! However, occasionally there's just an opportunity to partner with a great brand that we can't pass up -- such was the case with our August Classic dyer, The Verdant Gryphon. Bugga has been a popular yarn since The Verdant Gryphon was still part of Sanguine Gryphon (a brand that later split into two brands, Verdant Gryphon and Cephalopod Yarns.) This sport-weight yarn has a squishy 70% merino and 20% cashmere content, with just a touch of nylon to strengthen it up and make it perfect for all sorts of uses, from socks, to shawls and sweaters. Each skein holds a generous 412 yards, and we sent two to each member for a total of 824 yards. That's a lot of yardage to play around with, and we're already seeing some sweater planning happening! 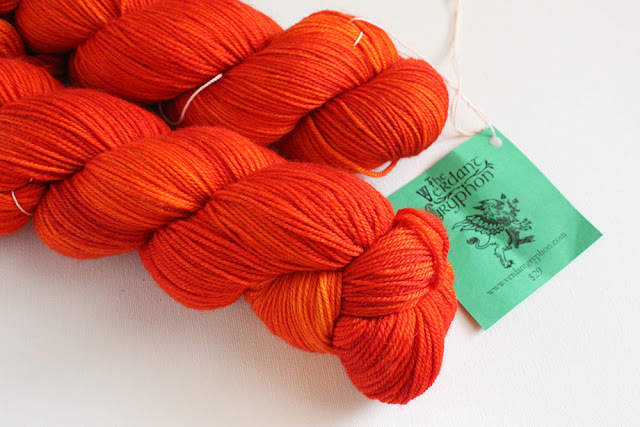 Of course, you can't just have a great yarn, you have to have great colors, too! We loved the subtle range of semi-solids from Verdant, so wanted to highlight these colorways with our choices. Many members traded around to get new color pairings (Awaiting the Tiger, the orange featured above, was sought-after to partner with the brilliant blues of River in Paradise, for instance.) 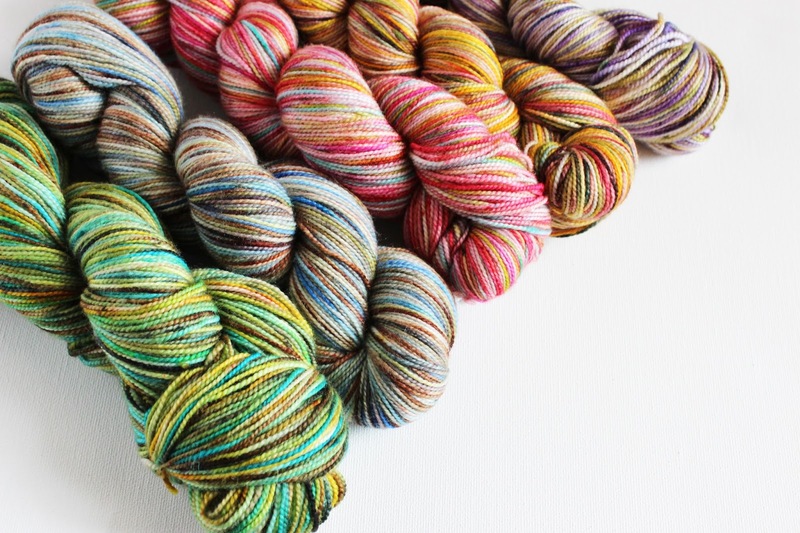 We expect to see some fantastically colorful pieces cropping up in the Yarnbox projects thread before too long! 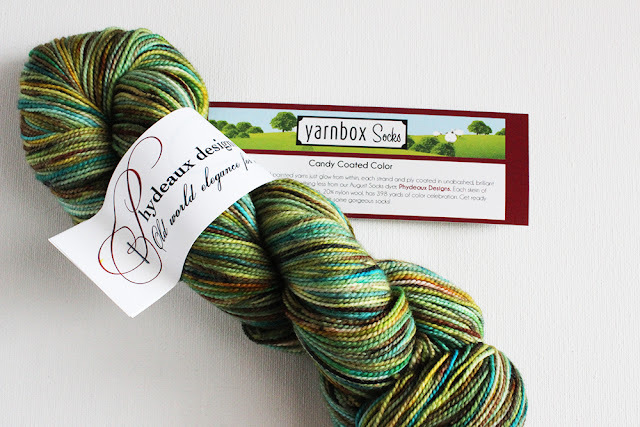 Speaking of projects, the patterns featured in this box were as pretty as the yarn! We brought back former featured crochet designer Katya Novikova for our crochet pattern this month, which she titled after the yarn. Lac Rose is a beautiful wrap with unique edging that should transition beautifully into fall. Alexis Winslow agreed to design something wonderful for our knitting members, and didn't disappoint. Her adorable Zea Hat & Mitts set served double-pattern duty -- we can imagine lots of members will be wearing this set come cooler weather! I think out of every question we get through our customer service panel, the number one question I hear most is: What is the difference between bright and muted? Today we're tackling this question on the blog and hopefully helping a few more members find the perfect 'sweet spot' for making their Yarnbox subscription exactly what they want each month! While we realize that color is a very subjective setting, here at Yarnbox we try and have a simple way of classifying each color we send out -- Bright or Muted. 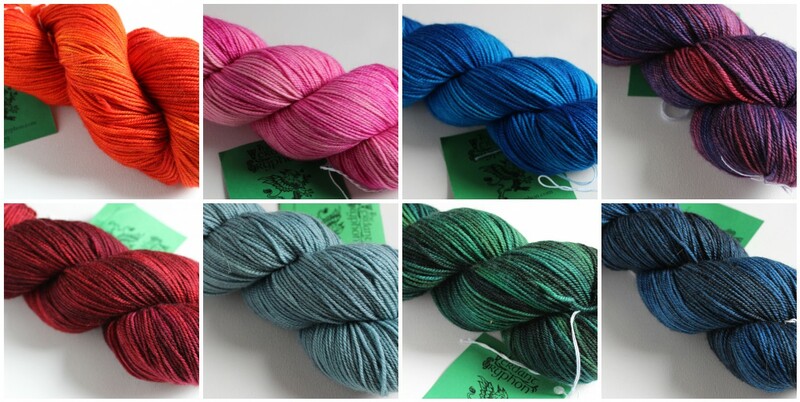 The "Nothing Too Bright" setting means that you prefer muted yarns instead of those with saturated, vivid, or vibrant tones. If you choose this setting, you'll get more earthtones, pastels, neutrals and dark colors. The "Nothing Too Muted" setting means that you like bright yarns instead of those with soft, pastel, earthy or neutral tones. If you choose this setting, you'll get more vivid, vibrant, and possibly neon colors. Here are some examples of past Bright and Muted color choices. Note -- these are just examples, and colors are decided on a case by case basis each month, and also are relative to the dyer's style. If one dyer mostly does softer tones, we'll pick the brightest soft tones they have for bright, and the best selections for muted that we can find. Vice versa, if a dyer does only saturated jewel tones, we'll try and classify those to match your selections, too. Of course, some colors are way harder than others, especially those with lots of variegation. When we're choosing a hue classification for heavily variegated colorways, we try and pick the overall tone of the yarn and go from that. 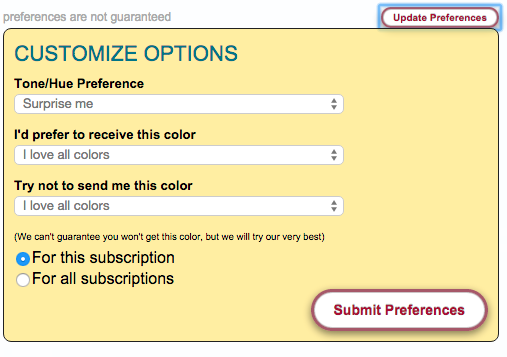 Make sure you click Submit Preferences afterwards, or your new settings won't be saved! You can set preferences differently for each subscription by choosing the 'for this subscription' button, or change the preferences for ALL subscriptions by choosing the 'for all subscriptions' button. There are time limits on setting your preferences -- once the labels are printed and packing begins, any changes will roll over for the next box. Hopefully this quick rundown helps you make the most of your subscription choices! There's just something special about Phydeaux Designs yarns! In early 2014, we shipped out a box featuring their Caresse base (now discontinued) that became one of our members' most favorite boxes that year. After another year and a half, it seemed about time to share the Phydeaux devotion with members of another club -- Yarnbox Socks. 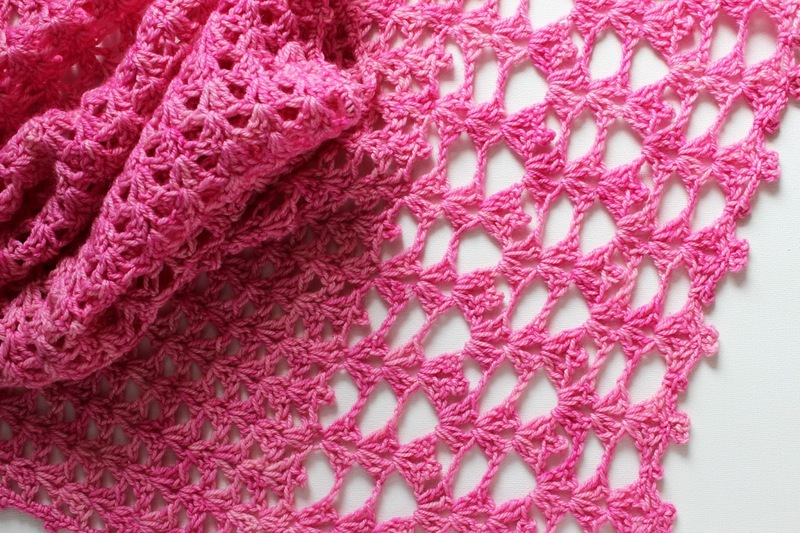 At first glance, you may think that this yarn is simply variegated - short, abrupt dashes of color throughout. However, we particularly love Brenda's approach to variegation because she does an amazing job with transitioning and blending the colors, while still letting them stand on their own. This creates a lovely, tonal variegated fabric as the yarn knits or crochets up, and makes for some truly exceptional socks! We sent out a gathering of five beautiful colors to our August 2015 Socks subscribers, including one new colorway Brenda developed for us -- Figue, a gentle purple and golden toned yarn that is already getting lots of attention from customers and designers alike. Of course, we can't send a beautiful shipment of Socks without an equally beautiful and inspiring pattern. Designer Katherine Vaughan delivered on this promise for us with her lovely Dark Hollow Falls Socks. 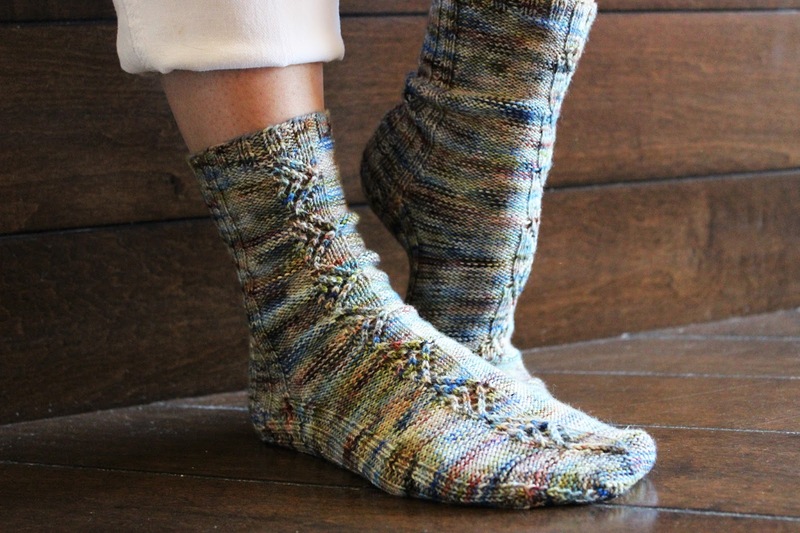 These socks use panels of reverse stockinette (purl side) to break up the variegation and highlight the diamond patterning and ribbing in other areas of the socks. I love the way the color seems to glow and generate its own light. It's almost as if Brenda's dye work activates a sense of chiaroscuro, a beautiful relationship between the lightest colors and darkest colors in every skein! What color did you get from this shipment, and what are you making?